When your family tells you the dish you just made was restaurant-quality—well, that feels pretty good. 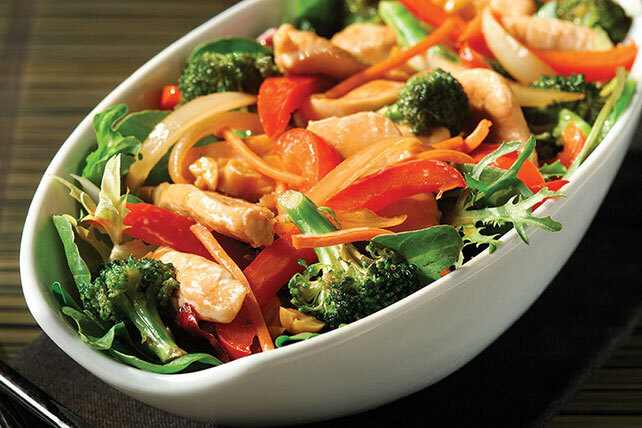 This Chicken Stir-Fry Salad will get the job done! Cook chicken in large nonstick skillet on medium-high heat 5 min. or until done, stirring occasionally. Remove chicken from skillet; cover to keep warm. Heat dressing in same skillet on medium-high heat. Add vegetables; cook and stir 3 min. Add chicken, nuts and soy sauce; cook 2 min. or until vegetables are crisp-tender and mixture is heated through, stirring frequently. Substitute shredded napa cabbage for the field greens. Substitute 1 pkg. (16 oz.) frozen stir-fry vegetables, thawed, for the cut-up fresh vegetables. Omit field greens. Prepare chicken and vegetable mixture as directed. Spoon evenly down centers of 4 warmed (10-inch) fat-free flour tortillas. Roll up and serve.